Pink-Haired Nimcompoop Re the Trump Campaign Using Facebook Data (Video) | What Did You Say? The Mainstream Media is hungering for another big Trump-bashing story. The Trump-Russia Collusion scandal turned out to be a non-starter, nothing but lefty wishful thinking gone viral. And all the apologies from the Progressive PR Arm — aka MSM? Uh…no. Crickets. Now they’re running like a bunch of crazed worker ants that just discovered an untended picnic basket full of honey and other sweet stuff. The big data-mining scandal is now all the rage. But seriously? Is there anyone on the planet who didn’t understand if you sign up for one of the Facebook apps, you have to agree to share your information (that would be data) with them. Hello? Anyone home McFly? Obama and his team did that very data-mining thingy and were lauded by everyone in Hollywood and the press. The 2008 Obama Presidential campaign made history. Not only was Obama the first African American to be elected president, but he was also the first presidential candidate to effectively use social media as a major campaign strategy. It’s easy to forget, given how ubiquitous social media is today, that in 2008 sending out voting reminders on Twitter and interacting with people on Facebook was a big deal. When Obama announced his candidacy in 2007, Twitter had only just started and there wasn’t even an iPhone yet. Oh goody goody! Barry was the King of Kool and using the social media and data mining tools like a boss! But now that the Trump campaign took advantage of the tools bravely pioneered by Obama’s Social Media Hope Guru’s, Donald’s IT crew is portrayed as Darth Vader’s Imperial Army. 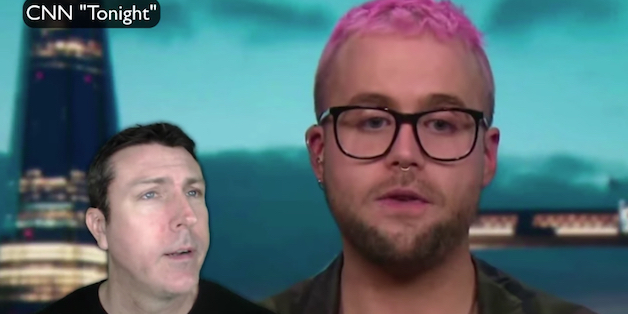 Check out this little pink-hair, nose-ring sporting whistle-blower. Oh yea. He’s breaking a big story. Thanks again Mark Dice for shining a light on more Lefty, Resist, Snowflake nonsense!